After being highly praised by beauty experts and celebrities alike, platelet-rich plasma (PRP) treatment is now widely known as a truly amazing rejuvenation treatment for both your skin and your hair. PRP treatment with Carmelo Plateroti, DO, FAOCD, FAAD, at Plateroti Dermatology in Templeton, California, gives you youthful and glowing skin without highly invasive treatments or surgery and also helps you regrow hair that you thought you’d never see again. Use the online booking tool or call the Plateroti Dermatology office to schedule your appointment now. Platelet-rich plasma (PRP) therapy takes advantage of your blood's natural healing components. Your blood platelets contain growth factors that help you regenerate tissue and form new tissue. When PRP is separated from the rest of your blood and then applied or injected, you can turn back the clock, restore, and rejuvenate. PRP therapy is great for facial rejuvenation, and it's also an excellent nonsurgical hair restoration option. Your Plateroti Dermatology care provider takes a small blood sample and runs it through a sterile centrifuge. The centrifuge separates your blood to isolate the plasma that's rich with platelets. Your Plateroti Dermatology care provider then uses the PRP on your skin or in your scalp, depending on which treatment you need. When your body absorbs PRP, you start healing at an accelerated rate in that area. In your face, this means new collagen growth and improved blood supply. New collagen smooths out wrinkles and improves firmness to give you younger-looking skin, while the improved blood supply improves your skin tone and overall look. In your scalp, PRP increases blood supply to your dormant hair follicles and thickens your hair shaft. This can help you start regrowing hair and strengthens your existing hair. How many PRP therapy sessions do I need? You may see results after only one session of PRP therapy for facial rejuvenation, but for optimal results, most patients have multiple treatments. Hair loss patients usually have a series of three sessions, spread over a month to six weeks. 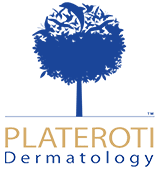 To decide exactly what treatment plan works for you, your Plateroti Dermatology care provider discusses your needs and goals with you before you get started. How does PRP work with other treatments? PRP is an excellent complement to other treatments. It's commonly used along with microneedling for facial rejuvenation. The microneedles make tiny (near-invisible) punctures and the PRP travels deep into your skin through those openings. In hair restoration, PRP combines very well with Neograft® hair restoration procedures because it supports the newly-implanted hair follicles to make them stronger and more productive. Use the online booking tool or call Plateroti Dermatology to learn more about how PRP therapy can help you.